In volume terms, U.S. dairy suppliers posted one of the best export second halves in history in 2016. Given the many challenges facing the industry—from more aggressive competitors to unfavorable currency exchange rates—it was a particularly solid performance. Interactive charts: Go to our market information section, where you can drill down interactively for granular data based on specific dates, exporters and more. Charts like the one shown above can be created in the U.S. Export Data section. Volume of major products (milk powders, whey, lactose cheese and butterfat) grew 15% over the last six months, compared to the final half of 2015. The 996,000 tons exported from July-December was second only to 1 million tons shipped in the second half of 2013—the current peak year for U.S. dairy exports. Multiple products recorded solid second-half performances (e.g., U.S. cheese exports +4%, NDM/SMP +21%), but whey was the star. Total U.S. whey shipments grew 33% from July-December, driven by record shipments to China. Pricing trends supported the increases. U.S. whey enjoyed a price advantage over EU whey for nearly the entire second half of the year. U.S. butter and cheese prices, which had carried a significant premium to EU and Oceania since the spring of 2015, grew more competitive last fall as international commodity prices at long last began to recover. The second-half numbers suggest the United States recouped some of the global dairy export share lost in 2015 and the first half of last year. While U.S. export volume of major products rose 15% in the July-December period, EU volume fell 1% and New Zealand volume gained a meager 1% (vs. the same period the previous year). 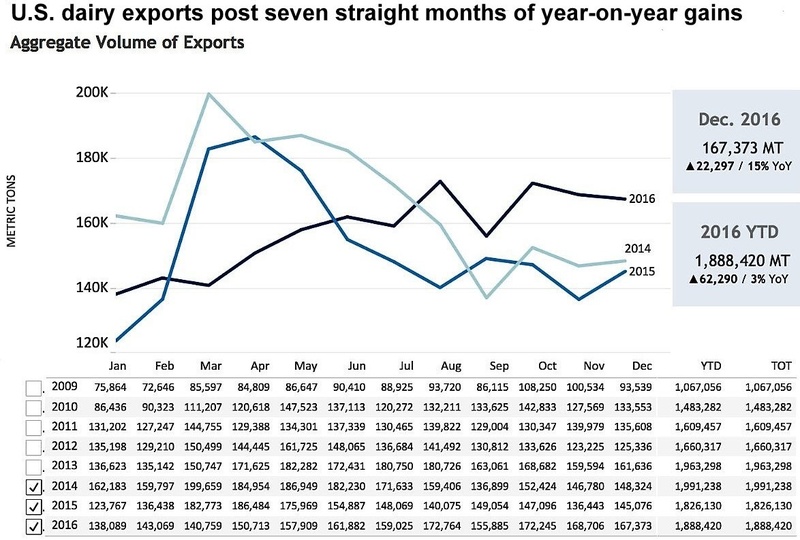 Prospects for continued U.S. export volume gains are mostly positive. U.S. pricing is better aligned with the world market, and the United States remains the only major supplier with excess product to sell. However, global markets are currently in a lull following the rapid price run-up in the second half of 2016. Buying interest has waned, particularly from more price-sensitive importers. Heavy EU stockpiles of SMP (352,000 tons in Intervention, equivalent to 1.5% of annual EU milk production) are casting a long shadow on the market. And the strong U.S. dollar and lingering soft oil prices continue to depress purchasing power around the globe. Meanwhile, U.S. exporters are watching for any pullback in buying from Mexico, by far our largest customer. USDA reports that due to concerns over a potential trade war, Mexican buyers have been seeking availability of product from other suppliers, as evidenced by a recent 15,000-ton purchase of SMP from Europe. U.S. exports finished 2016 strong, but 2017 has started with a mix of optimism and caution. Editor's note: This analysis is based on data available on February 21.